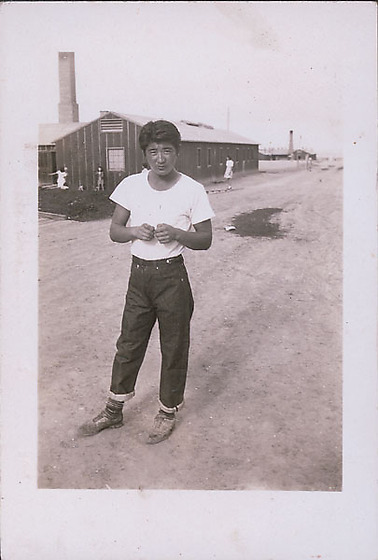 A young man, Kaz, who is a taxi driver at Heart Mountain concentration camp, Wyoming, stand in open area camp barracks behind him, 1943. He wears a white t-shirt and jeans with rolled cuffs. He looks directly at viewer. A few girls in background in front of barracks with smokestack. Written in pencil on back: Kaz Taxi driver 1943.